The Canon 24-70mm f/2.8 L USM II is a high-performance, medium-length, L-class zoom lens with USM autofocus. The 24-70mm focal length is great for mid-range subjects such as weddings, portraits, candids, travel and general purpose photography. This lens, with its mid-range zoom with fast aperture, is a popular choice with professional photographers. The f/2.8 aperture is available constantly through the entire zoom range. The lens is equipped with a circular, 9-blade diaphragm capable of beautiful and soft backgrounds at wide aperture settings. Weighing slightly over 800 grams, this lens can be carried comfortably and used hand-held for short periods. 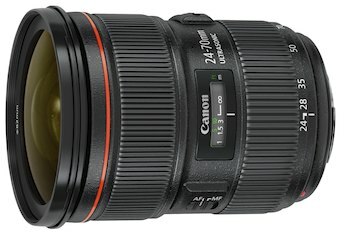 For events lasting several hours, the lighter Canon 24-70mm f/4 USM IS may be a better choice. This is lens is often compared with the Canon 24-105mm f/4 L USM IS.